With Android P soon on the way, most users have probably only recently updated to Android 8.0 Oreo, let alone Android 8.1. 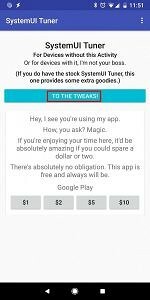 Android Oreo brings a ton of useful features such as better battery life/memory usage thanks to strict background app limitations, a picture-in-picture mode, notification channels, quicker boot times, and an Autofill API for password managers. Another useful feature is notification snoozing, a feature which finally allows you to temporarily dismiss notifications to declutter your status bar. 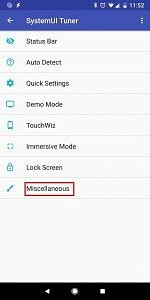 By default, you are only allowed to snooze notifications for 15 minutes, 30 minutes, 1 hour, or 2 hours, but if you are running Android 8.1 Oreo, it’s possible to customize those numbers without root. Here’s how. Although Android 8.0 Oreo introduced notification snoozing, it wasn’t until Android 8.1 Oreo that Google introduced a way to customize the snooze durations. Hence, this tutorial will only work on Android 8.1 devices such as the Google Nexus 5X, Google Nexus 6P, Google Pixel, Google Pixel XL, Google Pixel 2, Google Pixel 2 XL, Nokia 8, and any device running a custom AOSP-based Android 8.1 ROM. The method we are using involves changing a hidden setting via the Android Debug Bridge (ADB). Since this does not involve unlocking your bootloader or rooting your device, you can take OTA updates or make payments via Android Pay. All you need is your device, your PC, and an app developed by XDA Forum Moderator Zacharee1 called SystemUI Tuner. The app is available for free on the Google Play Store, but make sure you are running version 248 otherwise you won’t have access to this new feature. Set up ADB on your computer by following our tutorial here. Start up the SystemUI Tuner app and go through the setup screens. Accept the warning that pops up. Scroll down to the “Notification Snoozing” part. For the “default” pick the time, in minutes, that the notification snooze duration should default to. For “Time A” through “Time D” pick the 4 times, in minutes, that the notification snooze durations should be set to. For example, if I want 30 minutes, 1 hour, 2 hours, and 6 hours I would put 30, 60, 120, and 360 from A to D respectively. Make sure that the “default” snooze duration matches one of the numbers you picked in step #9. Finally, in order to make this stick on a reboot, tap on the menu button in the top right of the app and select “Settings.” Then, toggle “Safe Mode” to allow the app to restore these values on reboot. You’re done! 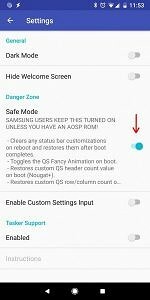 Something to keep in mind is that enabling “Safe Mode” displays an annoying notification in the status bar, but you can easily hide that notification by long-pressing on it and disabling its notification channel. Also, your new notification snooze durations won’t be available on any existing notification in your status bar—only new notifications that come in after you make this change. As a bonus, since you’ve already gone through the trouble of setting up SystemUI Tuner, you can play around with any of the other features offered in the app! There are lots of little tweaks here and there that might make your UI a little more pleasant to look at! Okay, so some of you might be wondering how exactly this works. 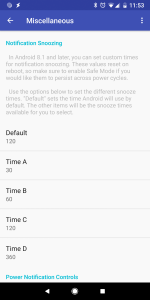 It’s rather simple, Google added a developer option that allows for changing the notification snooze options. This option can only be accessed via ADB since it resides in the Settings table. You can either change this option directly via ADB or grant an app the WRITE_SECURE_SETTINGS permission like we did above so the app can access the table. 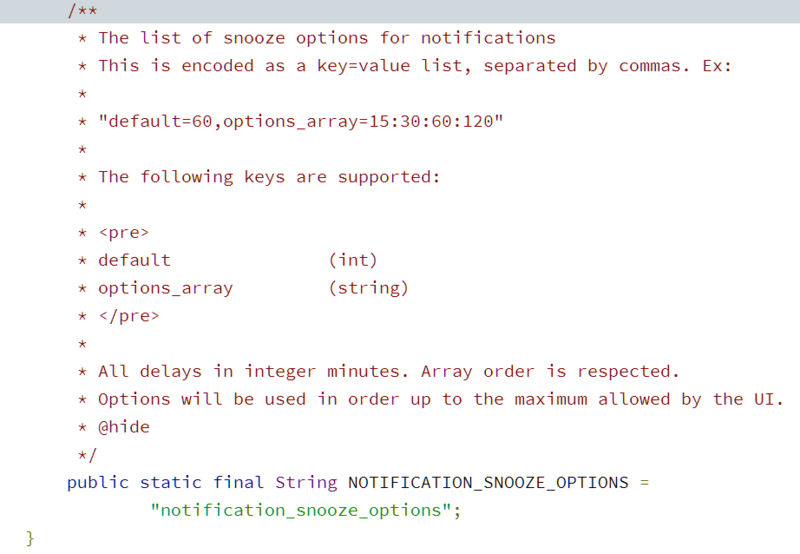 adb shell settings put global notification_snooze_options "default=60,options_array=30:60:120:360"
which is exactly how Zacharee1’s SystemUI Tuner app does it. I found out this little trick myself and asked Zacharee1 to add it to his app to make it a little easier on you guys, so enjoy this tweak!